Recently listed in the Amiami website where fans are speculating if this is true or false, we know have our clear look at the DX Zyuland Base. 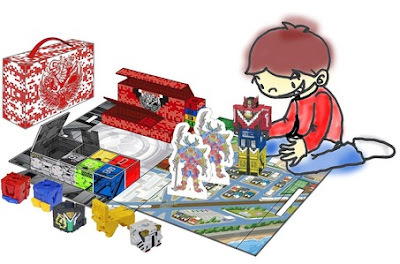 The DX Zyuland Base is a play mat for children where you can place your DX Zyuoh King and other Cube Animals from the Cube Animal Series and comes with cardboard cutouts. Looks like Bandai is bringing back the retro feel by bring back the play mats. Will we see this one in the series? Well, let's all wait till we more official images. I was expecting it to be more like a carrier mecha rather than a Play mat. This makes more sense than the previous one showing SPD Command Megazord/DekaBase. Cute, but relevant to my interests. Brace yourself for oncoming "ITS NOT DEKABASE?!?!??1! ?1" comments. But in all seriousness, I think it's been a while since we've had something like this. The last one I recall was one for Kamen Rider Den-O that had cardboard Gigandeaths and you could put your Den-Liner on it to recreate those fight scenes. Why do they have cut outs of Kibaoni Gengetsu? I'm calling fake. Most the toys in the picture aren't even colored correctly, and the cut out ar pe Kiba aoni Gnpengetsu from last season. Either someone at bandai. Ain't doing their job or this is fake. That picture wasn't meant to represent the Zyuland base, it was just an example of a base mecha in Sentai. How are people this retarded? Good lord, Anon 2! Are you serious? Really? You don't say. As a side note: Stay in school kids. Your Toku-Heroes would be disappointed in your lack of education, and worse common sense. First, the boxes, and now a mat? Looks like next year's sentai will be made our of paper cut outs - or better yet, just paper. Good ol' letter size paper.